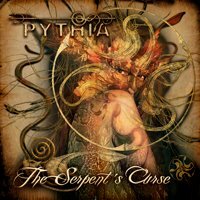 The Serpents Curse is the second album from Pythia. Pythia are a British band formed in 2007. The band members come from a range of musical backgrounds - vocalist Emily Alice Ovenden is a member of the classical groups The Mediaeval Baebes, and Celtic Legend, as well as being a published Novelist. Lead Guitarist Tim Neale was a founder member of London rock/metal band, Faith of the Few. Guitarist Ross White and drummer Marc Dyos were members of death/thrash metal band Descent. New bassist Mark Harrington is also a member of To-Mera, Keyboard player Richard Holland is a classical pianist. These different backgrounds are key as they feed in to making the music stand out as the different musical influences blend to create the final music. Since their formation, Pythia have played plenty of headline shows around the UK and have also supported bands including Arch Enemy, Ministry, Tarja Turunen, Fields of the Nephilim, Pagans Mind and Threshold, as well as headlining the Sophie Lancaster stage at Bloodstock in 2009, playing the Metal Female Voices Festival (MFVF) in Belgium in 2010, and playing well up the bill on the main stage at the 2010 Power Prog and Metal Fest in Mons, Belgium (headlined by the Scorpions). 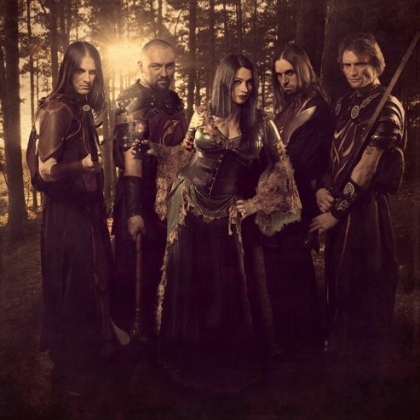 The bands excellent debut album, Beneath the veiled embrace, was released in 2009, so it's been a long wait for fans looking forward to a second album, but the wait is finally almost over. The album cover is a stunning image that was painted by renowned fantasy artist Brian Froud, whose work has been used as the inspiration for creatures in films including Labyrinth, and The Dark Crystal. Several of the songs on the album have been debuted during the bands recent live shows - Cry of our nation, Betray my heart & Just a lie, have all featured at least once in the band's live performances recently, and got an excellent reception from fans which is always a very good sign. The album opens with "Cry of our nation". The song starts with a slow introduction with a jangly acoustic-sounding guitar with some electric guitar wailing softly in the background and an almost military style drumbeat kicking in, then after a minute or so of this, the song suddenly explodes into action - the drums pounding at a frantic rate, the full guitar sound kicking in and Emily's powerful operatic style vocals really impressing. The song includes several changes of pace which really work well. A great start to the album. Next up is "Betray my heart" - the first single to be taken from the album. As you'd expect from a track that's been chosen as a single, its a really good song - fast and heavy but not quite as neck snappingly fast as parts of Cry of our nation. "Just a lie" was the first new song to be revealed by the band, way back in November 2010, and as such is the one song other than the single, Betray my heart, that many fans will have heard. Opening with some nice guitar work and pounding drums, this is another superb song - and my bet is that this will be the next single. As for the rest of the songs - well you're going to have to buy the album yourselves - and trust me, it's an album that's well worth buying. Pythia combine some superb guitar work, solid bass lines, and some impressive drumming with subtle use of keyboards to create some fantastic complex melodies within some very heavy tracks, and Emily's amazing vocals work fantastically well with this music. There is plenty of variety, both between songs, and within songs, with plenty of changes of pace. The drumming for instance varies from so fast you wonder how long Marc Dyos can keep going, to slower and more subtle, then back to hard and fast. Guitarists Tim Neale and Ross White both put in excellent performances on guitar, and Tim also does a good job on the bass too (the album was recorded while the band were without a bassist). The keyboards are well done - they round out the sound nicely without ever really intruding. The vocal talents of Emily Alice Ovenden are one of the big attractions of Pythia - she has the operatic qualities that you associate with singers such as Tarja Turunen, and has a very powerful voice as well as it being highly versatile - some bands have singers who stay within a very narrow range, but with Pythia, Emily's voice covers a wide vocal range. It's easy to see why Dragonforce recruited Emily to sing backing vocals on their new album - a voice this good is hard to find. With "The serpents curse" Pythia have released an album that is faster and heavier than the debut album, but isn't such a significant change that it would alienate their existing fans - they've still got the complex melodies, beautiful vocals and everything else that has won them an army of loyal fans, but they've added extra power to the music so it makes even more of an impact. It's an interesting choice given that many female fronted bands are gradually becoming less heavy and more radio-friendly, but bands like Lacuna Coil have attracted some criticism for this, so hopefully this means there is a ready market for a band that's ready to show they can play fast, hard and heavy without losing the melodies and subtleties that fans like. I can see this album winning the band a whole host of new fans. A fantastic album - go out and buy it. "The serpents curse" is due for release on 28th February 2012, on Golden Axe/Universal.